Do you want to rid yourself of a backup window or two? Continuous backup--also know as continuous data protection--is changing the rules by backing up in real time, or close to it. Finally, there's an HBA for everyone. Vendors are creating HBAs that are functional and affordable, even for smaller shops. Microsoft has revised its "No Exchange on NAS" policy to "No Exchange on non-Microsoft NAS." There are a few steps that organizations should follow during the first phase of an RFP. Cheaper high-end storage is here. Just what is persistent binding anyway? SANMelody V 1.4.0 is DataCore's new storage networking software. It's ideal for smaller shops, but may not work in larger companies. Here's a one-page review about FilePreserver from XLink Technology. It's a great idea, but there's room for improvement. Tired of overbuying, overconfiguring or overallocating storage? Utility storage--used in a similiar fashion as electricity or water in your home--may be the answer to your prayers. So much can go wrong with disaster recovery. What can you do to ensure all goes well? Metcalfe's law explains how the Internet works. But what about storage? Here are five rules to help you build a storage strategy. 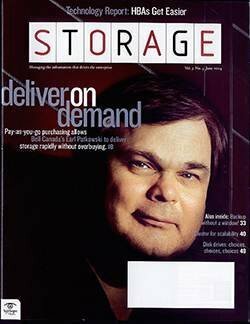 Storage bin: All Steve is saying is give startups a chance.